When E.C. Pielou wrote the chapter on Nunataks, Refugia and Relicts in her textbook entitled “Biogeography” (1979), I'm fairly certain that she was thinking of Greenland, Canada and Scandinavia. When I read it, the term “nunatak” immediately caught my attention, since the description gave me the perfect mental image I’ve always had of the origin of páramos since my first visit to these extraordinary biotopes as a child. The páramos surrounding the Colombian capital of Bogotá are a perfect example of this description. Located east, west and south of the city, it is easy to visualize ancient ice fields filling the valleys and slowly isolating one mountaintop from the other. Standing at the edge of the region, the glacial cuts are clearly visible on the mountainsides, and the very cold, driving wind is a constant reminder of how extreme weather conditions during the glaciations must have eliminated all but the toughest groups of plants. With this description in hand, it is also now much easier to understand the origin and current distribution of these mountain biotopes, as well as their fauna and flora. As one drives up to any of the páramo areas in Colombia, thermal or elevation levels can readily be surmised by the roadside vegetation. Climbing from premontane into montane and higher still into Andean wet forest, even where much of the original vegetation has been eliminated completely, relict shrubs and herbs give a clear image of what plants should grow, and where. Reaching the treeline, at ca. 9,750’/3,000 m, the landscape changes dramatically. Andean cloud forest morphs into elfin forest, dominated by the widespread, bonsai look-alike escallonia, Escallonia myrtilloides. Low shrubs are substituted by thick stands of Chusquea bamboo species, and suddenly, as you reach the plains, the vegetation takes a totally unexpected turn. The panorama reveals vast expanses of grasslands with staked fields composed of the imposing flower spikes of yucca-lookalike, Puya goudotiana, a large, heavily armed terrestrial bromeliad with inflorescences over 12’/4 m tall, as well as large numbers of the huge sunflower relatives, "Frailejones" (Espeletia uribei and E. grandiflora - see “The Friars Club” in this section). 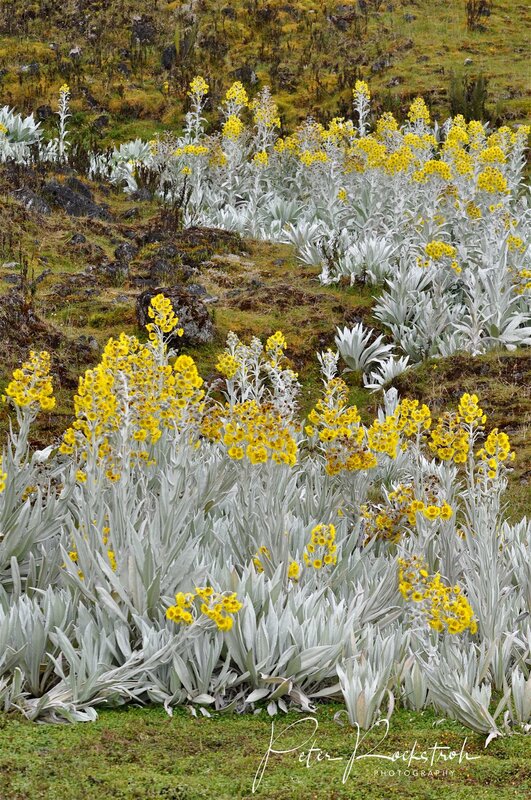 These are probably the plants most people in Colombia associate with páramo, yet they alone are far from defining what a páramo really is. Click on any of the smaller photo pairs in this article to open a full-sized, annotated image in a lightbox. As was pointed out at the beginning of the article, páramos are ice-age remnants. Plants native to these areas are adapted to low air pressure, dramatic fluctuations in light intensity, very low temperatures and punishing weather conditions - particularly during the frequent frosts and hailstorms. As the ice retreated a few unique plants expanded their distribution, but some remained isolated in cool upper elevation refugia where they had little competition. And many others were physically unable to disperse lower since they needed the intense solar exposure of the high plains to survive. That partly explains their origins and distribution. 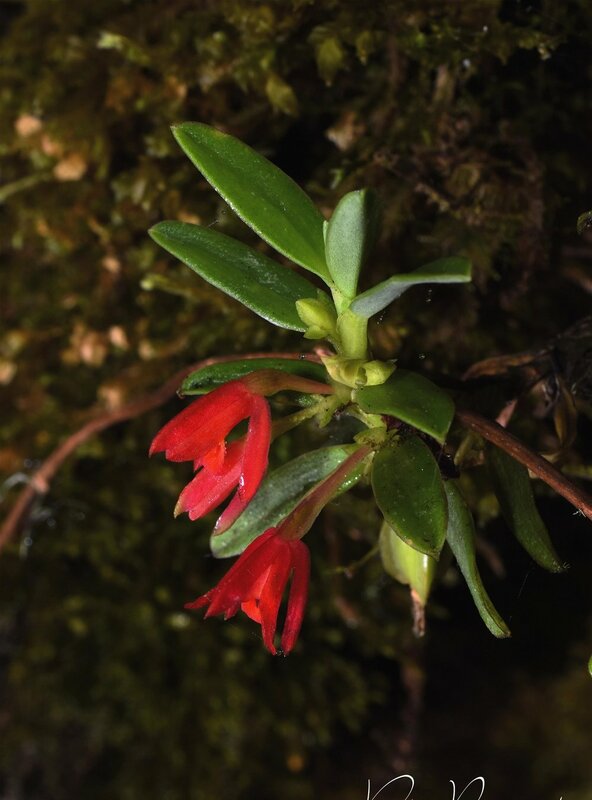 This is also the ecosystem containing the highest relative percentage of endemism of both plants and animals anywhere. ¿Why is this? After all, páramo is a relatively "young" ecosystem. That last statement is – surprisingly - quite true. Páramos were formed during the past 100,000 years. Why then the amazing wealth of life forms and the high amount of floral and faunal endemism? 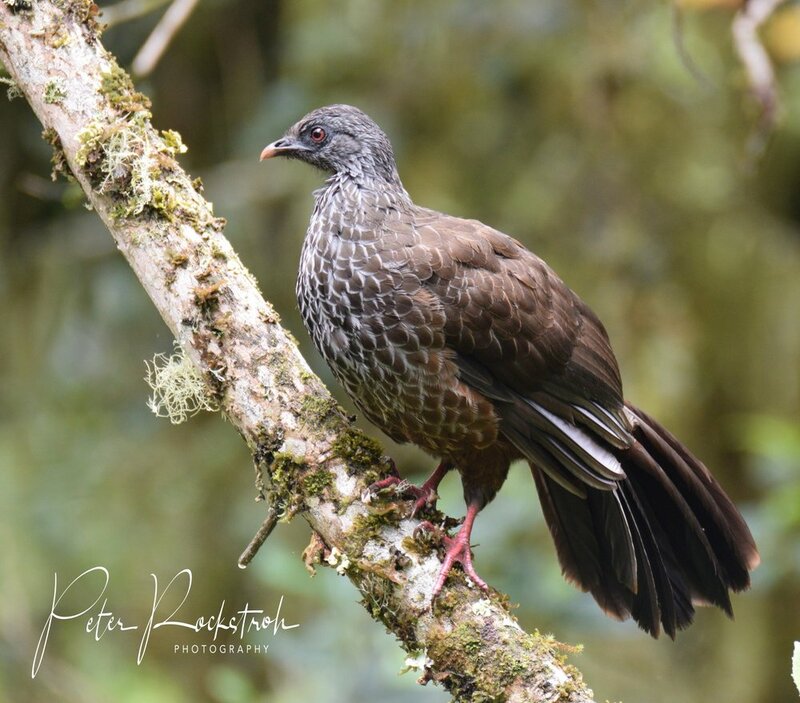 Apart from a few unconnected páramos and near-páramos located at the highest elevations of Costa Rica and Panamá (e.g. Cerro Chirripó and Volcán Barú), they run along the crest of the Andes north > south through Colombia and into other high elevation parts of western South America. When the ice retreated, it flooded large parts of the Orinoco and Amazon river basins. The water from these jungle plains forms huge cloud masses, which drift towards the mountain ranges and precipitate in their upper reaches. Even today, local páramos receive over 195”/5,000 mm rain annually. While not equivalent to that of the coastal Colombian Chocoan tropical pluvial forests, it is still a staggering amount of precipitation. These weather conditions, in addition to altitude and temperatures have made for a unique vegetational community in this ecosystem. Groups like bryophytes have maintained a huge diversity, as have fungi and ferns. These plants form the basis of these highland bogs. Mosses and sedges have taken the place of grasses, lichens and liverworts compete with them on vertical surfaces, and ferns have taken advantage of this water-retaining carpet to flourish throughout the year. From diminutive filmy ferns (Hymenophyllaceae), through handsome and abundant snake’s tongue ferns (Elaphoglossum spp.) to giant tree ferns (Cyatheaceae and Dicksoniaceae), they are all present in this superhumid environment. The fact that all these stunted trees are covered with mossy coats also helps to support huge numbers of orchids, bromeliads and other epiphytes. Many of these plants produce innumerable amounts of tiny, opportunistic seeds. When these seeds land on a carpet of permanently wet sphagnum moss, the chances are they will sprout, survive, thrive and radiate. And thrive and radiate they do. When the “Flora Genérica de los Páramos” was published (Sklenar et al. 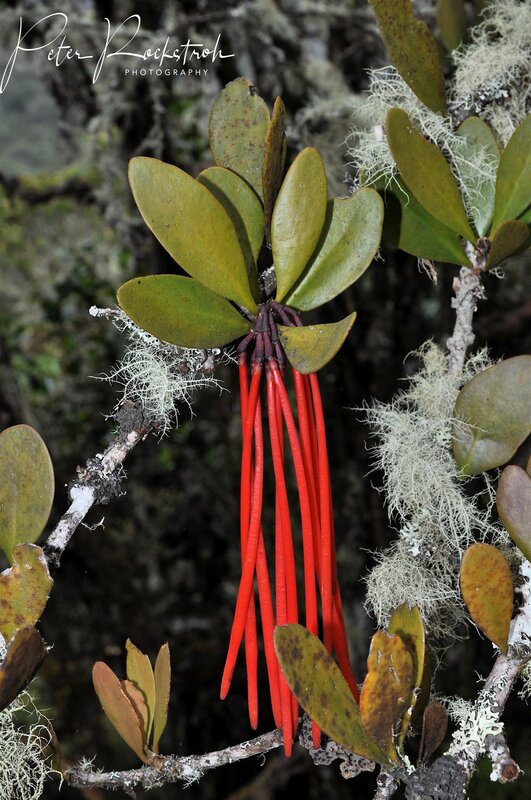 2005), it registered a scant 27 genera and 100 species of orchids inhabiting all the páramos of South America. Madriñan´s (2005) field guide, the “Flora Ilustrada del Páramo de Chingaza” documents just nine orchid species native to this particular area. Subsequent fieldwork by park guards and the previous park director at Chingaza have now photographically documented over 100 species of orchids in this 191,000 acre/76,600 hectare park alone. 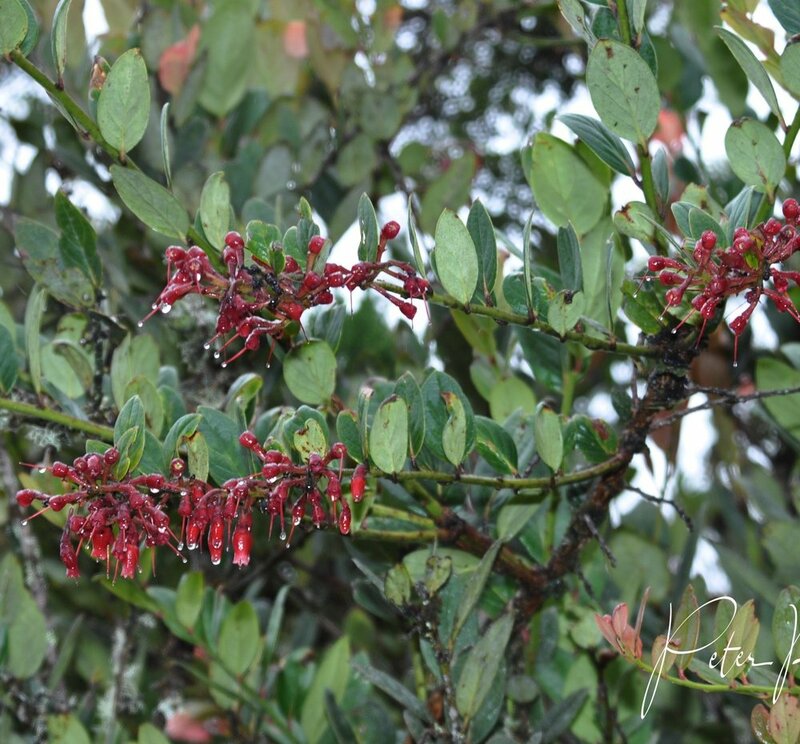 Shrubs including many Neotropical blueberries and false heathers (Ericaceae), melastomes (Melastomataceae) and mistletoes (Loranthaceae) have also been very successful colonizing these areas. Relying on obvious advertising to propagate and survive, they often produce massive blooms in vibrant colors that are visible even in the thickest fog and mist. Any drab or subtly-colored flower runs the risk that it will go unnoticed by pollinators. Despite the geologically recent vintage of páramos, they harbor a surprising wealth of specialized plants and an extremely high relative number of microendemics. But while there are many locally endemic plant species in this ecosystem, somewhat surprisingly, páramos have no endemic floral families. It seems that the extreme environmental conditions of this habitat have simply generated a relatively rapid speciation in small-sized and low-growing plant groups. Local wildlife also presents an interesting variety of specialties. The largest páramo mammal is the woolly tapír (Tapirus pinchaque), a cold weather tolerant species related to T. bairdii from Mexico, Central America and western Colombia and the more widespread lowland tapir, T. terrestris, which occurs throughout tropical South America. White-tail deer (Odocoileus virginianus goudotii), widespread throughout the continent, are common in this habitat and form the mainstay of the diet of pumas (Puma concolor), the largest predator in these haunts. Besides the well-known but still bewildering diversity of hummingbirds (Trochilidae), other páramo birds also show specialization to this challenging ecosystem. Well-known Neotropical lowland mammals including paca (Agouti paca), coatis (Nasua narica) and agouti (Dasyprocta spp.) all have their páramo counterparts in pacarana (Cuniculus taczanowskii), mountain coati (Nasuella olivacea) and the red acouchi (Myoprocta acouchy). Páramo is also the preferred habitat and distribution area of the endangered and hopelessly photogenic spectacled bear (Tremarctos ornatus), the continent’s only bear species. Ever increasing numbers of nature-loving visitors are traveling to Colombia to enjoy its incredible natural beauty. They often travel large distances and spend considerable amounts of money in country during their trips to take in as much of its amazing biodiversity and as many unique life forms as possible. And while they are inevitably amazed by Colombia's scenic wonders, relatively few take advantage of the ease of access and proximity of this wild, unique and fantastic ecosystem to its capital city. 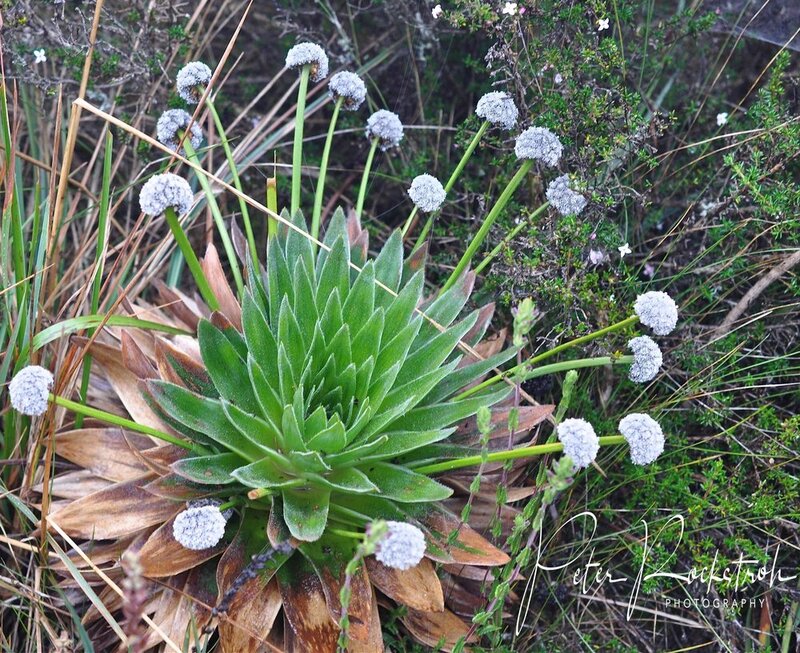 Páramo is a breathtaking highland landscape with both spectacular and fascinating plants and animals. If you visit Colombia be sure not to miss it!